Thankfully nursing a second baby turned out to be a lot easier than the first. But I forgot just how time consuming it is! Nursing the first was easier because I had all the time in the world, though it was more painful. 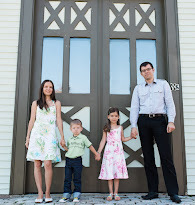 Nursing the second, and I imagine subsequent babies, is tough because you have to care for the other kids. This is where the KoalaKin has been a life saver for me! We were sent one for review with our newborn. At first I thought that I wouldn't use it much, or that it would be too much hassle to put it on. I certainly was wrong! While I could do okay without a KoalaKin with one baby, having a toddler to care for - it has proved to be indispensable. I can wear the vest at home pretty much all day and attach/remove the pouch with the baby as needed throughout the day. 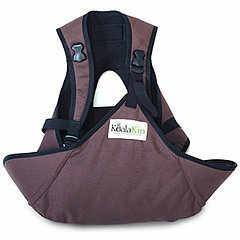 In the photo below I'm wearing the KoalaKin at Thanksgiving dinner after I nursed the baby (with the pouch unsnapped). Baby T is one week old here! I love how comfortable it is and how easy it is to use. I've tried nursing in a sling and gave up, the KoalaKin breastfeeding nursing pouch is so much easier and more intuitive. I could use it right out of the box without needing directions. I also appreciate how discreetly I can nurse with it, it almost doubles as a nursing cover - just without additional hassle. This is definitely a product I would recommend to all nursing moms, first timers or not. It frees up your hands to get things done while nursing. You may still need you hands to help the baby out the first month or so, when they need some help with the latch. After that the hands are pretty much all yours, you can eat your meal, work (great for WAHMs), read, tend to your toddlers, etc. It can be used with a baby up to 25 pound (my 3 year old only weighs 27 pounds!). This is not a sling or baby carrier, it is intended for breastfeeding only. The KoalaKin retails for $89.99 and an optional extra pouch costs $39.99. I think it is a little expensive for a product with such specific use, but still worth it, I really can't think of anything like it. As I said, I use it pretty much all day. I wish they also came up with a way to make it into a baby carrier too with a different carrier attachment and safety strap. That way you would be able to get even more use out of it! That wold be need to have, i've been walking with my baby feeding her, while getting things done. Lately getting breakfast and dinner ready for kids tasking with one hand. That sounds like a really neat idea! I couldn't tell you how many times I needed to have my hands free while breastfeeding and had the hardest time making it happen.